What is the QAnon conspiracy theory? 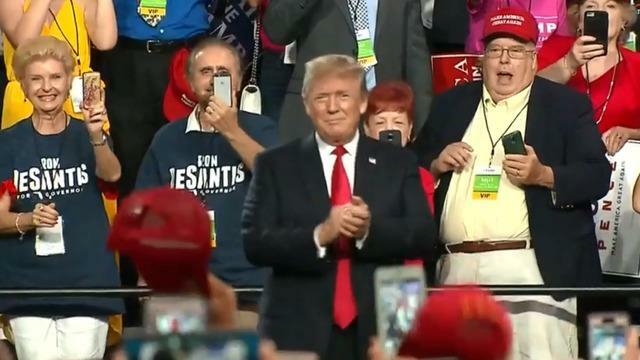 A number of attendees at President Trump's rally in Florida on Tuesday were decked out in homemade apparel celebrating QAnon, a convoluted conspiracy theory that's taken off among a segment of Mr. Trump's base. So what is QAnon, and why are we talking about something this ridiculous? Those who subscribe to the QAnon conspiracy theory believe that a person who posts messages on the 4Chan and 8Chan internet message boards under the name "Q" is a high-ranking government official. And according to Q, Mr. Trump is on the verge of exposing a cabal of pedophiles, globalists, and celebrities who secretly control America. That's the central gist of the theory, anyway. The rest is open to some degree of interpretation, which is necessary because Q's posts tend to read like riddles. But YouTube videos created by QAnon believers help fill in the gaps and create a storyline that's more-or-less comprehensible. QAnon exists as a kind of parallel history which a "deep state" took over decades ago. An all-encompassing theory of the world, it's able to tie together and explain everything from "Pizzagate" to ISIS to the prevalence of mass shootings and the JFK assassination. Many Q fans believe that President Kennedy was set to reveal the existence of the secret government when he was assassinated. They also believe President Reagan was shot on the deep state's orders, and that all the presidents since he left office -- with the exception of Mr. Trump -- have been deep state agents. The military, eager to see the deep state overthrown, recruited Mr. Trump to run for president. But the deep state, which controls the media, quickly tried to smear him through "fake news" and unfounded allegations of collusion with Russia. Despite the deep state's best efforts, however, Mr. Trump is winning. Q is releasing sanctioned leaks to the public in order to galvanize them ahead of "The Storm," which is the moment when the deep state's leaders are arrested and sent to Guantanamo Bay. Q's adherents have called this process "the great awakening." The storm takes its name from Mr. Trump enigmatic comment last October about "the calm before the storm." Q began posting soon after, and said that the storm Mr. Trump referenced are a coming series of mass arrests that would end the deep state forever. In QAnon lore, Mr. Trump is secretly working with special counsel Robert Mueller to bring the deep state down, and the storm is a kind of Judgment Day to in which the evildoers are punished and the faithful are redeemed. Q has repeatedly suggested that the storm would hit in the very near future, and has even said certain people would be arrested at certain dates. When those dates come and go without any arrests, Q says that they needed to be delayed for one reason or another, but that Mr. Trump still has the situation well in hand. Q's posts tend to be either vague or totally incomprehensible, but QAnon fans are more than happy to try and decipher them. Last year, for example, Q posted a photo of an unnamed island chain. Eager to divine the reasoning behind the post, QAnon adherents tried to prove that the photo must have been taken on Air Force One, which in turn meant that Q was traveling with the president. The Q posts are known to the faithful as "breadcrumbs." The people who then try to figure out what they mean are called "bakers." According to The Daily Beast's Will Sommer, QAnon adherents also spend a lot of time trying to figure out who in the government is a "white hat" Trump supporter and who is a "black hat" in league with the deep state. Their rallying cry is "where we go one, we go all," a line from the 1996 Jeff Bridges sailing adventure "White Squall" that they misattribute to President Kennedy. The phrase is frequently abbreviated to "WWG1WGA," which Roseanne Barr -- one of several celebrity QAnon promoters -- tweeted in June. Former Red Sox pitcher and current right-wing radio host Curt Schilling has also promoted QAnon online. The name refers to Q-level clearance at the Energy Department. But who's behind the posts is anybody's guess. According to Sommer, the QAnon faithful sometimes point to former national security adviser Michael Flynn and White House aide Dan Scavino as possibilities. Others believe it's Mr. Trump himself. Another theory is that John F. Kennedy Jr. faked his death and now posts on 8Chan as QAnon.